Although many fund managers struggle to navigate turbulent markets and maintain competitive performance from their funds, the challenges posed by shifting investment markets can often help to distinguish who the top fund managers are. Top performing fund managers continuously monitor their investment strategy to help to ensure their funds maintain a suitable balance. The underlying holdings of their funds are made up of established and robust companies that are well positioned to maintain greater stability during periods of market turbulence. They are therefore able to ensure their funds continue to be competitive compared to their peers; whose strategies often leave them more exposed during such periods. We look back on the performance of more than 100 fund management firms and rate each based on the proportion of funds under their management that have done better than their competitors in 2018. With 88.9% of the unit trust & OEIC funds under their management outperforming at least half of their peers, Vanguard ranked as the top performing fund manager of 2018. In total, they have 27 funds with a least 1-year performance history. 18 of these funds returned growth over the past 12 months that was better than at least three-quarters of the funds within the same sectors. A further six Vanguard funds returned growth that was greater than at least half of their peers. 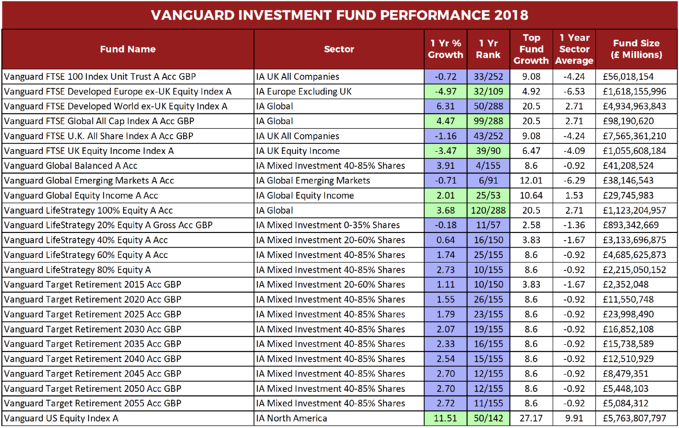 The largest Vanguard fund to return top quartile growth within their sector was the Vanguard Target Retirement 2050 Acc GBP fund, which currently holds assets of £7.57 billion. This young fund launched in December 2015 and over the recent 12-months it ranked 12th out of 155 funds in the IA Mixed Investment 40-85% Shares sector, which was comfortably above the -0.92% sector average for the period. 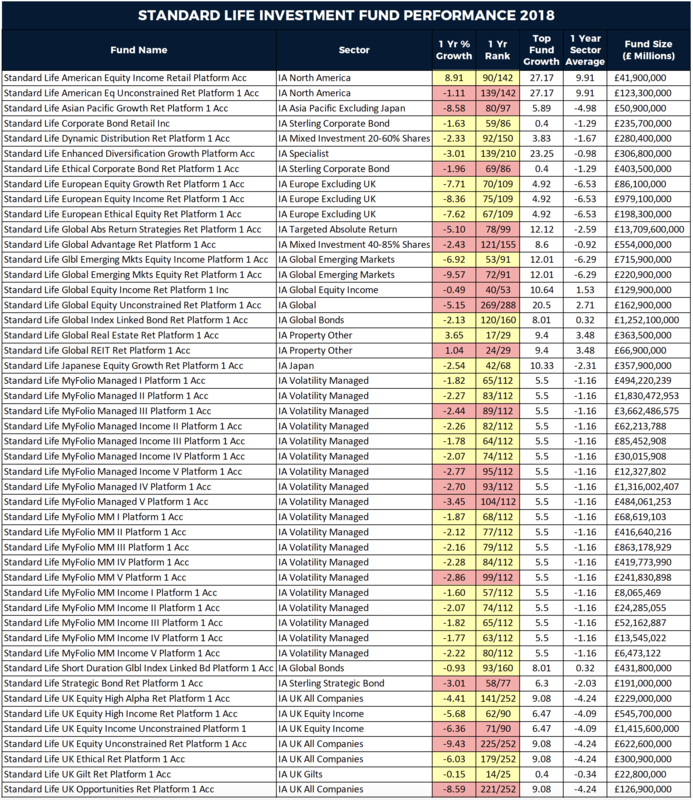 In total, they have 27 funds with a least 1-year performance history. 18 of these funds returned growth over the past 12 months that was better than at least three-quarters of the funds within the same sectors. A further six Vanguard funds returned growth that was greater than at least half of their peers. The largest Vanguard fund to return top quartile growth within their sector was the Vanguard Target Retirement 2050 Acc GBP fund, which currently holds assets of £7.57 billion. This young fund launched in December 2015 and over the recent 12-months it ranked 12th out of 155 funds in the IA Mixed Investment 40-85% Shares sector, which was comfortably above the -0.92% sector average for the period. Ranking 2nd for performance in 2018 was Close Brothers Asset Management with 13 of their 15 funds returning growth over the past 12-months that were higher than at least half of competing funds within the same sectors. 5 of which managed to return growth that was better than 75% of the funds within the same sector. Among the best funds of 2018 was the Close Growth Portfolio, which sits within the IA Flexible Investment sector alongside 138 competing funds. The average growth for this sector over the past 12-months was -1.55%, but with returns of 2.19%, the Close Growth Portfolio managed to outperform 91% of its competitors. Architas established during the turbulence of the 2008 financial crash, and their diverse multi-manager style has helped them to grow their assets under management to £23.3 billion and gain a reputation as one of the strongest fund managers in the UK. Architas currently have 34 funds under their management, but only 20 have sector classification. Out of these 20 funds, 12 outperformed at least three-quarters of their sector peers over the past year, and 5 returned growth that was better than at least half of their competitors. Among the top-ranked funds in 2018 was their MA Blended Growth Portfolio, which sits within the IA Volatility Managed sector along with 111 competing funds. Over the past year, this fund returned growth of 1.56%, which was better than 91% of competing funds. This fund is also 1 of 8 Architas funds that have managed to consistently maintain a top quartile sector rank over the past 1, 3 & 5-year periods. Stewart Investors have 11 funds under their management, and over the past year, 6 of these funds have maintained a top quartile sector ranking. Despite their relatively small size, Stewart investors have managed to amass over £13 billion of investment in their small selection of funds. The majority of this has been through their hugely popular Asia Pacific Leaders fund which alone accounts for £7.9 billion of their total funds under management. As well as being a popular choice for investors this fund also has a history of reliable performance, and over the past 12-months, it managed to return growth of 9.17%, which ranked 17th out of 210 funds in its sector. Ranking 8th for fund performance this year was Newton & BNY Mellon.  Newton is a global investment management firm, founded in 1978 and owned by BNY Mellon. Their range of funds are popular with many UK investors, and currently, the total assets under their management exceed £51 billion. One of the best performing Newton funds is their Global Income fund, which has amassed funds under management of £5.3 billion. Over the recent one year period, this fund returned growth of 6.71%, which was the 5th highest of all 53 funds in its sector. It hasn’t just been the recent 12 months where this fund has excelled. Over the past 3 & 5 years it has consistently been one the highest growth funds in its sector. Firmly rooted at the bottom of the table is the recently formed Merian Global Investors, who now manage the funds previously under the management of Old Mutual Global Investors. Their funds have had a difficult 12 months with 90.3% returning growth that was worse than at least half of their peers (competing funds within the same sectors). Over the recent one year period, 28 of their 31 funds returned growth that were lower than at least half of all other funds within the same sectors, with some posting huge losses. The Merian Global Equity Absolute Return fund is their largest fund with over £13 billion of client funds under management. Despite its popularity, this fund returned negative growth of -6.43% over the past year, which was worse than 86% of its peers. 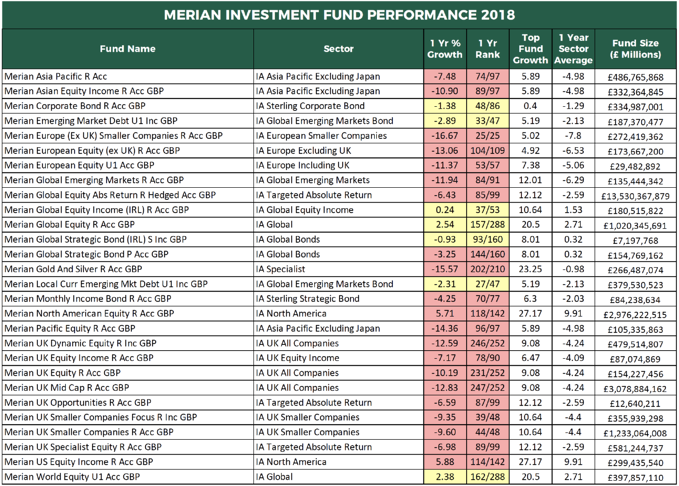 The Merian Europe (EX UK) Smaller Companies fund, had a torrid year as it ranked the lowest of all funds in its sector with negative growth of -16.67%, with several other Merian funds posting double-digit losses. Another fund manager to struggle in 2018 was Lazard Asset Management. From their range of 10 funds that are currently available to UK investors nine returned growth that was in the bottom half of their sector. 7 of these 9 funds lost money for their investors this year, one of which was the Lazard European Smaller Companies fund. This fund was their worst performer with negative growth of -11.94% over the past 12-months. Hit hard by the financial crisis of 2008, RBS has endured years of instability, which has seen them fall behind other banks and asset managers when it comes to their investment offering. Currently, RBS manage 11 unit trust funds which are only available to their existing customers. Each of these funds were analysed for performance alongside all other sectors. Unfortunately for RBS, all 11 of their funds consistently ranked among the very worst in their sectors for performance. Standard Life boast of an “excellent track record” that has seen them amass funds under management totalling £71.9 billion. However, the fact is, the significant proportion of their funds have a history of underperformance. Our recent performance analysis of 64 of their sector classified unit trust funds found that over the last 12-months, 48 had performed worse than at least half of their competitors. Among the worst performers was the Standard Life Global Absolute Return Strategies fund, which holds a vast £13.7 billion of client assets, making it one of the largest funds in the UK. Over the past 12 months, this fund returned negative growth of -5.10% to rank 78th out of 99 funds in its sector. Another of their funds to disappoint was their Global Equity Unconstrained fund, which sits within the competitive IA Global sector alongside 287 competing funds. The past year has been a terrible one for this fund as it performed worse than 93% of its competitors with posting negative growth of -5.15%. 2018 has been a year of low returns for many investment markets with growth across all sectors down significantly to that of the previous year. With growth figures down, investors and adviser should focus on ensuring their portfolios maintain the appropriate balance and that their underlying funds remain competitive within their sectors. As we head into 2019, there are various forecasts and opinions as to what the future holds for investment markets, but with issues such as Brexit and the unresolved trade dispute between the US and China, fund managers will again be faced with challenging market conditions. But for investors, another year where conditions are likely to remain challenging will only help to highlight the good fund managers from the bad. For numerous reasons a fund can experience periods where its performance is not as competitive as its peers, but for the funds that are managed by high-quality fund managers such periods do not happen very often, and they are typically short-lived as they can adapt to any challenge posed. Equally, some funds can perform well during volatile markets, but when markets change or become more stable, they can struggle to deliver long-term competitive returns. With this in mind, it is important to look at the longer-term performance of a fund and its fund manager to assess their true quality.